When sharing the road with cars, you’re bound to run into the angry, aggressive drive who likes to speed by you at mach 3, six inches from your elbow. Not a lot of fun, definitely raises your heart rate and throws you into defensive mode. Over the past 3 months of going by bike, I’ve noticed a pattern and some habitual nasty passers along Beach Drive in Rock Creek Park. (hmm….Blue BMW, DC plates that start with DF, likes to buzz me toward the north end of Beach Drive after 8am…) I’ll get yelled at, honked at, cut-off, and while I want to shout, throw things and when I’m really agitated there’s the urge to fly the bird, but really, a) Are they even going to see/notice; b) It will only make them dislike cyclists more; c) Makes me look like the jerk instead of them. So then what does one do, when you get off the road, to avoid drivers like that, and then get yelled at by angry pedestrians? There is about a 100-yard stretch in my morning commute, where I cross the street and pop up on the sidewalk to enter my building’s parking garage. My office is on a busy street (East-West Highway) so riding on that street, isn’t the brightest idea, hence why I pop on the sidewalk. And it’s not a small neighborhood sidewalk, it’s a city sidewalk, wide enough for people to walk 4-5 abreast at least. But apparently, there wasn’t enough room on it this morning for a cyclist. I was just about to my building when a more-than-un-athletic woman walks right in my path, and yells “BAD IDEA, you DON’T ride a bike up the sidewalk.” I’ve ridden this sidewalk for 100 yards almost every week-day for the past 3 months and have never had an issue until today. I didn’t get it. Maybe she was just having a bad day and took it out on me, who knows, but it definitely upset me. Once in my building, I described the incident to a co-worker trying to figure out why this woman was so angry with me. Turns out, my co-worker used to ride to work as well – riding through Capitol Hill neighborhoods and was once actually pushed off the sidewalk, and wrenched her shoulder because of that. Guess I was lucky to only get a verbal scolding. But this brings me to a perplexing question – where’s the love for cyclists? Cars honk and yell at us to get off the road, pedestrians yell and push us to get off the sidewalks, so what’s a cyclist to do? 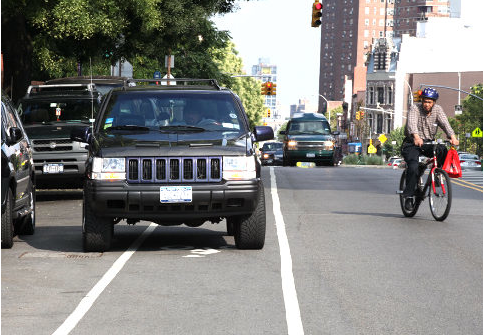 Yes, there ARE bike lanes, but the bike lanes don’t go everywhere, and often people see bike lanes as places to park cars or dump yard refuse. So where is a cyclist supposed to ride? Road or sidewalk? What about paths? Path or road? And then there’s the issue of dirt trails, for example, the ones in Rock Creek Park, which horses are allowed to pound the ground with their hooves and leave ‘pony pies’ along the trail, yet they are forbidden to cyclists, who are very pro-active about trail stewardship. I don’t understand. Thoughts? Where should a cyclist ride? With cycling gaining popularity, and more people starting to go by bike, it’d be nice to see a little more love out there for cyclists. And at the same time, cyclists need to be considerate of cars and pedestrians. 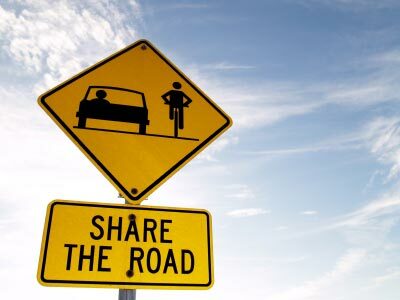 The old saying – it’s a two-way street, so if we want more respect from cars and pedestrians and the ability to truly share the road, while our tempers may rage at the random rude driver or pedestrian, it is always important for cyclists to obey the rules of the road.